This is the RESOURCES INDEX. Scroll down for child speech assessment and intervention resources, and CPD links, articles and information. The intervention resources include Singleton Consonant and Consonant Cluster pictures, Vowel pictures and vowel contrasts, Consonant Minimal Pair pictures, Near Minimal Pair pictures, and wordlists and worksheets based around facilitative articulatory contexts, nonlinear phonology, complexity principles and lexical properties. There are also Slide Shows about the assessment of, and evidence-based intervention for, children's speech sound disorders. Please consider donating to the upkeep of this site. THANK YOU! On this page you will find the ALPHA Test of Phonology; Clinically Useful Words; Speech Characteristics Rating Form; Stimulability Assessment; The Locke Speech Perception - Speech Production Task;The Quick Screener and The Quick Vowel Screener; and The Quick Screener for Teachers. A flow chart from Peter Flipsen Jr PhD. Roslyn Neilson PhD has researched and developed three tests of phonological awareness. 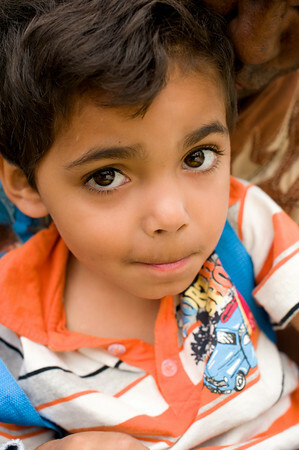 The tests may be administered by speech pathologists, psychologists and teachers. A 1-page pdf to aid phonotactic assessment. These are links to the page that contains the forms. Go to the page and scroll down to find the ALPHA, Quick Screener, SCRF, and Stimulability forms. These are links to the pages that contain the pictures, not direct links to the pictures themselves. Click on the links below and scroll to the foot of the page to locate two sets of Einstein pictures and two versions of the Adele Miccio Character Cards for Stimulability Therapy, updated in 2012. These are links to the pages that contain the slide shows, not direct links to the slide shows themselves. This slide show is at the foot of the page. This slide show is immediately under the picture at the top of the page. See Backward Chaining near the bottom of the page. How Max Learned to say "Leura Public"
See Successive Approximations at the bottom of the page. This slide show is under the heading "Slide Show and Web Page"
These two slide shows are are near the bottom of the page. This slide show is at the bottom of the page with a handout too. Minimal Pairs - Oh boy! It's a test! This slide show is under heading #4. These three slide shows are at the foot of the page. These two slide shows are under the heading "Slide Shows". This slide show is near the bottom of the page immediately before the second picture. This slide show is near the top of the page, below the picture. These are links to the pages that contain the word lists, and except for #6 and #7, not direct links to the word lists themselves. These word lists under "Phonological Tendencies & Reduplication". These word lists are under "Phonotactics - Syllable Structure"
These /s/ words are listed on the web page - you don't need to download a pdf. This pdf is under the heading "Listening Lists"
These word lists are at the end of the section headed "Lexical Properties"
These are links to the pages that contain the work sheets, not direct links to the work sheets themselves. Each work sheet is a pdf. In the branch of Clinical Linguistics called clinical phonology, the abbreviations SIWI, SFWF, SIWW and SFWW are used to describe where sounds occur in spoken words. SIWI is "syllable initial word initial". In the word "ball", /b/ is SIWI. SFWF is "syllable final word final". In the word "rub" /b/ is SFWF. SIWW is "syllable initial within word". In the word "about" /b/ is SIWW. SFWW is "syllable final within word". In the word "tablet" /b/ is SFWW. The terms are used to denote how the words are pronounced by an individual, not the way you spell them, or the way they "should" be pronounced. So, for example, when you break a word like "innocent" into syllables with regard to how you might spell it you get inn-o-cent. But when most speakers of English SAY the word it becomes (roughly!) ih-nu-sent so that the /n/ is SIWW (not SFWW as it would be if you said in-uh-sent). Many speech-language pathologists / speech and language therapists use these abbreviations when they look at "phonotactics" (the patterns of vowels and consonants, or syllable shapes a child can produce) in detail, as part of a phonological analysis. The information is useful in choosing therapy targets and devising word lists for production practice and auditory bombardment (focused auditory input) when appropriate. Consonants are classified in terms of their place of articulation, manner of articulation and voicing. 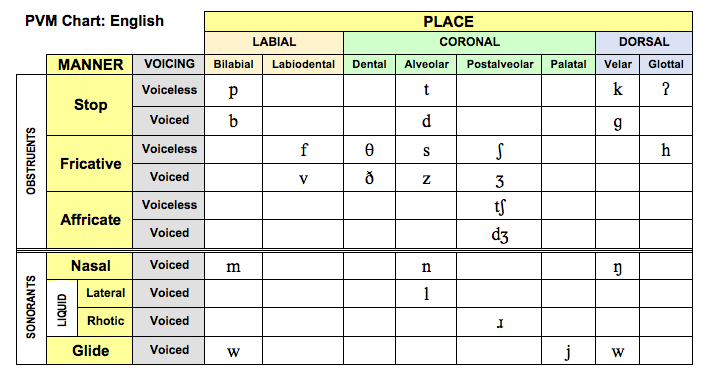 The chart below is a PVM Chart showing the consonants of English. The voiced glide /w/ is included twice because it has two places of articulation, bilabial and velar. The glottal stop is also there because it occurs in some varieties of English. There are more definitions in the glossary.